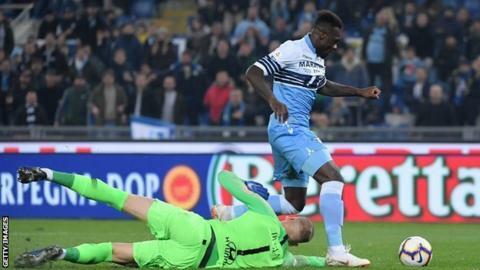 Goals from Felipe Caicedo, Ciro Immobile and Danilo Cataldi secured a comfortable victory for Lazio against city rivals Roma. Former Manchester City striker Caicedo rounded goalkeeper Robin Olsen for the opener after 12 minutes. Immobile's penalty doubled Lazio's lead in the second half before Cataldi's side-footed finish made it 3-0. Roma defender Aleksandar Kolarov was sent off late for two yellow cards in quick succession. It was a deserved victory at the Stadio Olimpico for Lazio, their first in five matches in all competitions. Simone Inzaghi's side stay sixth but the win sees them narrow the gap on fifth-placed Roma to three points. Roma will now turn their attentions to the last 16 of the Champions League, where they take a 2-1 first-leg lead to Portuguese side Porto on Wednesday. Match ends, Lazio 3, Roma 0. Second Half ends, Lazio 3, Roma 0. Second yellow card to Aleksandar Kolarov (Roma) for a bad foul. Ciro Immobile (Lazio) wins a free kick in the attacking half. Stefan Radu (Lazio) is shown the yellow card. Aleksandar Kolarov (Roma) is shown the yellow card. Edin Dzeko (Roma) is shown the yellow card for a bad foul. Attempt missed. Javier Pastore (Roma) right footed shot from outside the box misses to the left. Assisted by Bryan Cristante. Danilo Cataldi (Lazio) is shown the yellow card for excessive celebration. Goal! Lazio 3, Roma 0. Danilo Cataldi (Lazio) left footed shot from outside the box to the bottom right corner. Assisted by Sergej Milinkovic-Savic. Patrik Schick (Roma) wins a free kick in the defensive half. Thomas Strakosha (Lazio) wins a free kick in the defensive half. Attempt missed. Edin Dzeko (Roma) header from the centre of the box misses to the left. Assisted by Bryan Cristante. Substitution, Roma. Patrik Schick replaces Stephan El Shaarawy. Attempt missed. Edin Dzeko (Roma) header from the centre of the box misses to the left. Assisted by Diego Perotti with a cross. Substitution, Lazio. Danilo Cataldi replaces Joaquín Correa. Sergej Milinkovic-Savic (Lazio) is shown the yellow card for a bad foul. Attempt missed. Senad Lulic (Lazio) right footed shot from outside the box is too high following a corner. Corner, Lazio. Conceded by Bryan Cristante. Goal! Lazio 2, Roma 0. Ciro Immobile (Lazio) converts the penalty with a right footed shot to the bottom left corner. Federico Fazio (Roma) is shown the yellow card for a bad foul. Penalty conceded by Federico Fazio (Roma) after a foul in the penalty area. Penalty Lazio. Joaquín Correa draws a foul in the penalty area. Substitution, Lazio. Marco Parolo replaces Luis Alberto.